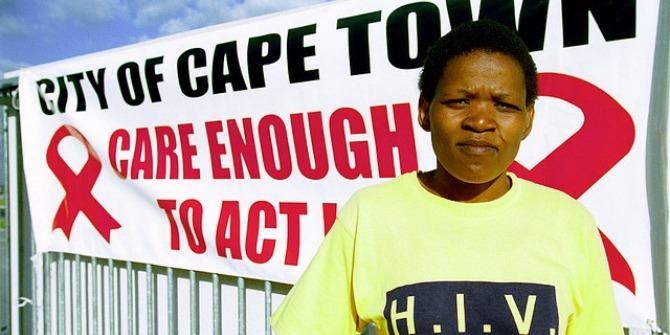 HIV/AIDS and the South African State: Sovereignty and the Responsibility to Respond. Anamarie Bindenagel Sehovic. Ashgate. 2014. Author Anamarie Sehovic presents a rich narrative of South Africa’s HIV/AIDS epidemic as the backdrop for testing and extending theories of statehood and sovereignty. The first half of the book provides an analysis of the domestic context of HIV/AIDS in South Africa before describing the international framework within which policy decisions were negotiated by the state. The second half is a history of South Africa’s response to the epidemic as it unfolded over three distinct phases. Throughout the book, the author aptly weaves her discussion around theories of limited sovereignty as the state attempted to negotiate its own response alongside interventions by non-state and external state actors. Sehovic’s narrative makes the salient point that throughout its 30 year struggle with the epidemic, South Africa has negotiated its response to HIV/AIDS both concomitantly and in opposition to external and non-state actors. Far from enacting a consistent policy agenda, interventions have tended to be reactionary, often irrational responses to countless internal and external factors that have influenced the governments of Mandela through Mbeki to Zuma. The first state response to HIV and AIDS in South Africa came between 1981 and 1998 when a ‘paradox of competing freedoms and fetters’ characterised post-apartheid politics (p. 42). In the turbulent political setting of ‘apartheid’s demise to HIV/AIDS’s rise’ (p. 97-101), it had become a weapon for parties on both sides to advance competing political and racial agendas. Despite pseudoscientific claims and some outrageous conspiracy theories, this period also saw some of the first steps towards a more rational response to the epidemic. In 1990, the Maputo Statement, which set out the first approach towards tackling HIV/AIDS, was followed by the establishment of the National AIDS Coordinating Committee of South Africa (NACOSA). NACOSA intended to bring together a range of state and non-state actors, including political parties, trade unions, businesses and civic groups to foster an effective response. After the government failed to follow through with the initiative, much of the agenda setting has been dismissed as ‘policy polemics’, as it soon became apparent the South African state had chosen to prioritize the transition to democracy over the incipient threat of HIV/AIDS (p.98). The second phase (ca. 1998-2003) coincided with the entry of anti-AIDS medications, antiretrovirals (ARVs) onto the global market in 1996 (p. 108), to which the state’s failure to respond opened the gates to the ‘international community’ of sovereign states (p. 11), prompting opposition from local advocates and activists in alliance with global state and non-state actors. The third phase (ca. 2003-2011), it is argued in Chapter 6, became the struggle for ‘ultimate responsibility’, where a patchwork of disjointed tactical solutions to the problem of HIV/AIDS by both state and external actors were in need of reconciliation. It was in this phase where Sehovic identifies the underlying issues associated with sovereign responsibility and accountability as coming to the fore. Moreover, the challenges present at the time affirmed what she defines as the ‘Governance Accountability Problem’ (GAP), which seeks to conceptualise the broader phenomenon of limited statehood. In arriving at her definition of the GAP, the author understands the state’s responsibility to respond as being derived from three tenets of sovereignty, namely, (i) to ensure the territorial and physical security of citizens; (ii) to protect lives and livelihoods by providing basic economic stability, health and welfare; and (iii) to bear accountability to itself and to the international community. The last tenet clearly foreshadows the main thesis in the book of the Governance Accountability Problem, whereby the state is held to account by an international community of states, and to some extent the non-state entities they support, yet importantly lacking an inverse stipulation (Figure 1). In drawing these conclusions, linking this fascinating context to statehood and sovereignty,HIV/AIDS and the South African State isa valuable contribution to cross-disciplinary literature exploring effective responses to combatting HIV/AIDS as well as other global ‘grand challenges’ that require the collaborative efforts of state, external state and non-state actors. For instance, while some countries have made impressive gains in achieving health-related targets set out in the Millennium Development Goals, others are falling behind. Often the countries making the least progress are those affected by high levels of HIV/AIDS, economic hardship or conflict (WHO, 2013). Affordable healthcare (and other welfare) services in these regions requires effective collaboration between public-private actors, multidisciplinary thinking and creative approaches to overcome the high cost of delivery against seemingly unsurmountable odds. More than 33 million people around the world currently live with HIV (Gates Foundation, 2014). Despite huge investments via multilateral organisations, the delivery of affordable and effective healthcare services to ‘the bottom billion’ seems to be first and foremost a coordination challenge between state, non-state and external-state actors. In the context of HIV/AIDS prevention, the risk of coordination and ‘accountability’ failure is heightened by the barriers present in weak institutional contexts, which obstructs formal design mechanisms enacted by meta-agents such as WHO, UNICEF and UNAIDS. Sehovic’s outstanding work makes this point effectively, although further research into public-private interventions in these contexts is required.